On February 27, 1869, American physician, bacteriologist, and industrial medicine expert Dr. Alice Hamilton was born. She was one well-prepared doctor. Hamilton graduated from the University of Michigan Medical School, pursued internships at hospitals for women and children, and then bacteriology and pathology at German universities. Research at Johns Hopkins led to her professorship in pathology at the Women’s Medical School of Northwestern University and on to a position as bacteriologist. The 19th century Chicago industrial environment launched her daily contact with the injuries and illnesses suffered by the area’s working men and women. Well-educated, well-read, and well aware that these occupational medical problems were not much studied in the country, Hamilton wrote articles on the issues she encountered. She tackled poor sewage disposal, poisonous chemicals, lead dust, occupational toxic disorders, poor industrial hygiene, and mental health problems exacerbated by being fired for sickness. Two years later, the state of Illinois formed its Occupational Diseases Commission and appointed Hamilton as its director. After contributing to both state and national health committees, she became the first woman professor at Harvard Medical School teaching industrial medicine. She wrote the field’s first American textbook Industrial Poisons in the United States. Hamilton joined Harvard’s School of Public Health and added another text, Industrial Toxicology, to its repertoire. In her autobiography Exploring the Dangerous Trades, Hamilton takes the reader through some of strategies and tactics she applied to make the workplace cleaner and safer. Hamilton has become known as the founder of American Occupational Medicine studies. 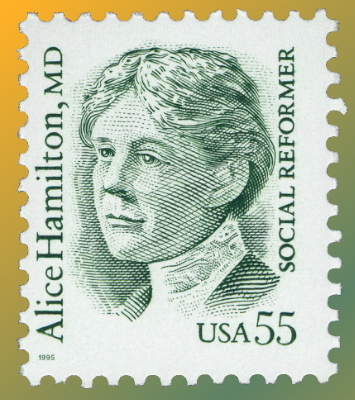 For her outstanding accomplishments in industrial toxicology, Hamilton was the first woman to receive the Lasker Award in public health. Her contributions to public health are memorialized on a U.S.P.S. postage stamp in the “Great American” series. The National Institute for Occupational Safety and Health dedicated its Cincinnati facility as the Alice Hamilton Laboratory for Occupational Safety and Health. This institute also presents annual awards in Hamilton’s name to honour scientific excellence in technical and instructional materials by its scientists and engineers in biological science, engineering and physical science, human studies, and education. This entry was posted in On This Day and tagged Dr. Alice Hamilton, February 27, industrial medicine, occupational medicine, On This Day, The Roberta Bondar Foundation. Bookmark the permalink.